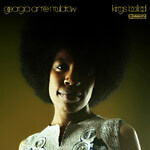 I'm afraid I've lost count of how many albums this is from her, but if one thing is for sure its that Georgia Anne Muldrow is an incredibly busy, talented and gifted woman. The album is ''a celebration of creativity and uniqueness, things that are necessary to a meaningful life expression. It's about being yourself.'' Slicing pop n'lock-friendly funk with gospel and gracious soul, it appears the seeds of her early experimental releases are now blossoming as her trademark scattershot beats and adventurous deep jazz melodies have grown to become the backbone for fully crafted songs. Partner (MC and producer Dudley Perkins) describes the release as her most ''pop'' record to date. If only all pop was this free-spirited and barefaced. With aspirations to be a modern-day Quincy Jones, Muldrow is truly a renaissance musician. She is always looking to take her craft to a higher ground. She channels her unstoppable creativity into music that is commercially viable but does not lose sight of her essence as an artist who challenges the norm.